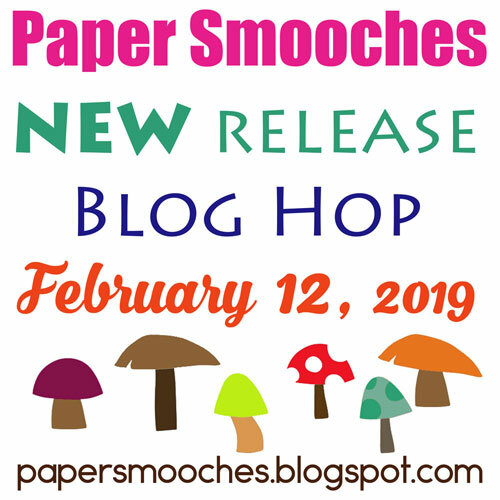 Paper Smooches NEW February Release Hop! Hello everyone! (I’m SO excited!) It’s time to share a sampling of the NEW Paper Smooches FEBRUARY 2019 release! ONE new stamp set and FOUR new dies will be available to purchase at 10:00 AM Central time zone on February 14th. 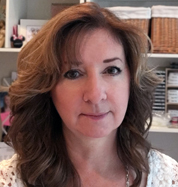 You will find the new products in the Paper Smooches store HERE once they go live. To add extra fun to our blog hop…there is a prize — a $25 gift code to use in the Paper Smooches on-line shop. FOUR winners will be chosen at RANDOM from any of the design team blogs as well as the PS Blog to win the $25 prize. Deadline: You have until midnight Central time on February 14th to leave a comment. Share our blog hop on Instagram @papersmooches. Please check the Paper Smooches blog on February 15th to see if you are one of the FOUR lucky winners. 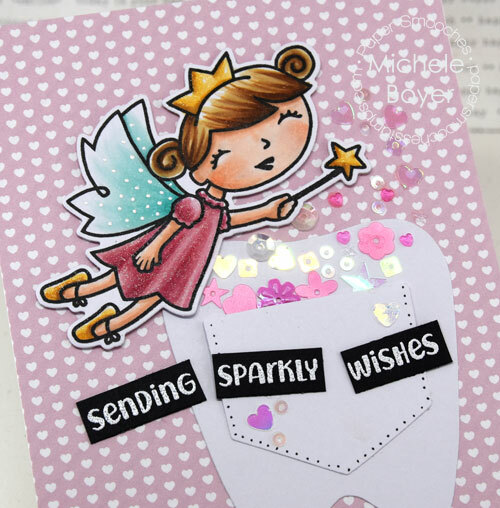 Today I’m sharing a card using new So Cute Fairy stamp set and coordinating dies. She was stamped onto X-Press It Blending Card then colored with Copic markers. After coloring, I added subtle sparkle using a clear Wink of Stella glitter brush and added dots to the wings using a Kirarina Wink White Pearl pen. I paired the fairy with Tooth Fairy dies, adding fun sequins from Queen & Company into and falling out of the pocket. Cute paper is Happy Hearts, also from Queen & Company. Thanks so much for visiting today, and good luck! Oh, such a darling card. I love the tooth die and the sequins! What a cute card! I love all the sequins! Amazing!! Love this so much…..
Awww…..you made her a tooth fairy. So clever and adorable. I love all the sparkle. TFS! What a darling tooth fairy! Cute and fun as the tooth fairy! 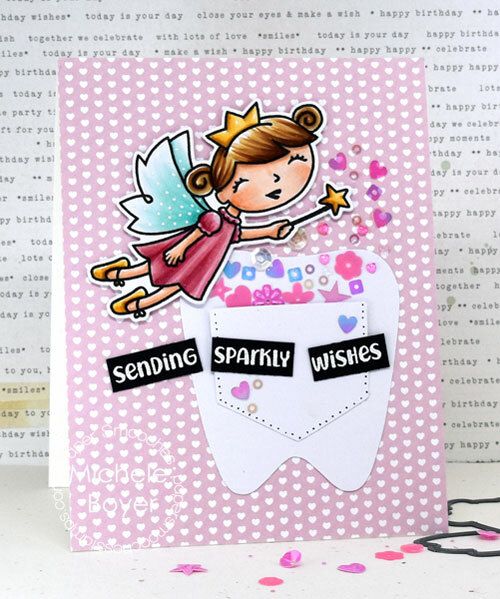 Such a creative card with the tooth and pocket, and of course, that adorable little fairy from Kim’s new release! I like how you turned her into a tooth fairy! Sweet card! The tooth fairy is very sweet! I love the little touch of sparkle you have falling out of the tooth pocket! That tooth pocket is the sweetest thing! What a cute card. Fabulous coloring! Totally sweet card! This is so sweet! Love her polka dot wings. Oh my goodness! Such a cute card and I’m so happy I found your blog!! OH! She makes a perfect tooth fairy! Darling! She is adorable and sweet in pink. .
Adorable! Love your sweet little tooth fairy, so clever. Beautiful coloring and design. What a darling card and brilliant idea to make her the tooth fairy! Darling! I love the little tooth! Great coloring too! that is too cute, love how you colored her hair, the sequins sprinkling is a cute touch! Super cute idea to make her into the tooth fairy! The big tooth with the sparkly embellishments is so fun. Your coloring is beautiful! 1. Awww! This card is too cute!!! Cute card, great coloring. I love that you made her a tooth fairy, super sweet. So cute! tfs! Super excited for the new release!! Cute tooth fairy card. I love how you capture the magic of the right of passage to adult teeth. Oh my gosh, I love your tooth fairy! Great card! I love your card, it’s so cute! I love that you made her into a darling tooth fairy! Super cute card! Love this sweet fairy! Super cute fairy card. Lovely colors. She is so sweet. Love your card. Lovely! The bright colours are fantastic! What an adorable fairy!! Such lovely colors and so cute!! I shared on FB about the release and hop. Cute tooth fairy card! Thanks for the chance to win. Such a cute and clever idea and a fabulous way to stretch the use of your stamps!